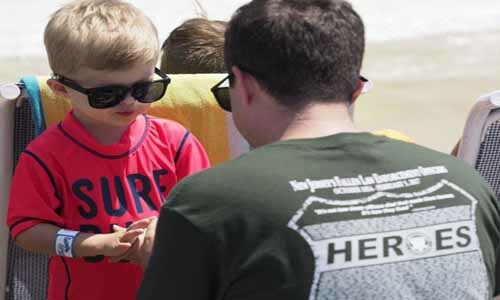 SEASIDE HEIGHTS -- Families that lost law enforcement officers killed in the line of duty gathered at Breakwater Beach and Casino Pier in Seaside Heights on Tuesday for the 10th Annual Law Enforcement Survivors Day. The event, hosted by the Storino family, is not a memorial. It's meant to be a fun day for the survivors of police officers killed in the line of duty. State, county and local law enforcement officials, as well as Lt. Gov. Kim Guadagno, attended the event. Guadagno stressed the importance of the gathering. "For all of you that are here right now, look around you because everybody here is experiencing exactly the same thing," she said. "The idea is for you to exchange memories, remember all the good things and understand you are not alone." Nearly 500 police officers in New Jersey have been killed in the line of duty since 1854. "We share a bond that can't be broken as the families of survivors," said New Jersey State Police Lt. Colonel Patrick Callahan. "We are strong and resilient when we are together." Nick Dell'Acqua, of Toms River, a retired Essex County police detective, attended the event in honor of his former partner, Patrolman Keith Neumann, who was accidentally shot and killed by a fellow officer during a pre-dawn drug raid in Irvington in August of 1989. "This a way of honoring Keith and all the other fallen officers," Dell'Acqua said. "They are not forgotten and are still in our memories." Families who attended were given free access to the waterpark, rides on the Casino Pier and a free arcade card. Lunch was also provided. Patti Sapone may be reached at psapone@njadvancemedia.com. Follow her on Instagram @psapo, Twitter @psapone. Find NJ.com on Facebook.